An article from the Toronto Star for those opposed to bike lanes. "Kathleen Willing, 79, still drives, uses transit, and even rides her bike two or three times a week. But her husband had to give up driving, and she says it wasn't an easy conversation to have." 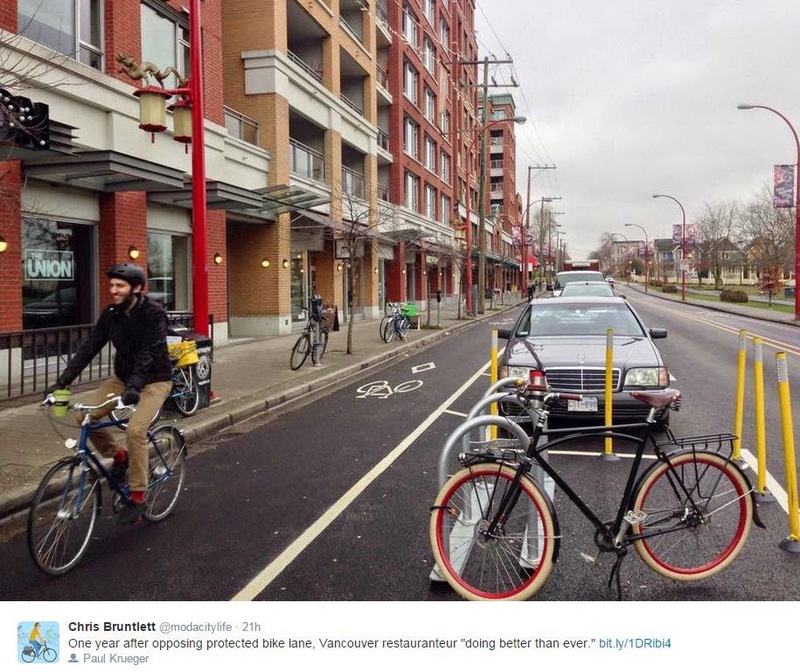 Segregated bike lanes give people an option to their cars. 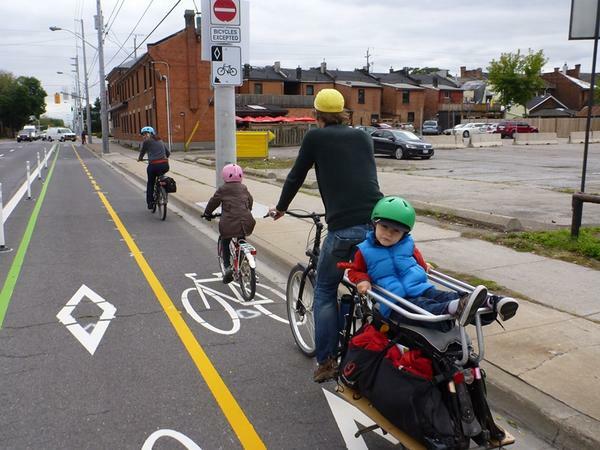 Ordinary bikes lanes will encourage a very small %age of the population to cycle rather than drive. Sharrows such as those we have on Fairview Street are a waste of taxpayer dollars. They will not get more people cycling. Bike lanes on New Street are marginally better but still won't get a significant number of people cycling. If Burlington is serious about giving residents, young and old, transportation options, segregated bike lanes are needed on major roads. 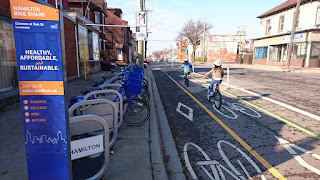 Segregated bikes lanes, like Hamilton's Cannon Street and those in Ottawa will have to come to car centric Burlington. The older people get, the greater the need for a safe, convenient alternative way to get around. If you build it & it's safe, they will use it!! Even New York City is building and expanding protected bike lanes or cycle tracks. Add judging by the number of cyclists, everyone from all ages uses them. The creator of the video posted the following comments, "I've been riding in this city since the early 1990s. If you ever told the ever-optimistic 25 year old me that you'd see these numbers of people riding along the waterfront on Kent, I'd probably say you were dreaming. But sometimes with good planning and putting people first, dreams do come true." With protected bike lanes, more will cycle, especially those concerned with safety. This will mean fewer short trips by car and a happier healthier Burlington. Business owners were not happy! "adding bike lanes there would require moving several dozen street parking spaces onto nearby Main Street — so the city faced a firestorm from retailers and residents. "To slash and burn like this is not going to work," Steve Da Cruz, owner of an upscale restaurant in the middle of the affected block, told the Vancouver Courier." One year after installation, Da Cruz told Business in Vancouver that his restaurant was doing better than ever. "We definitely have benefited from the increased usage of the bike lane," Da Cruz said. Bike lanes work! They encourage more to cycle and are better for business. Numerous studies across North America show that cyclists are good for business. A new study by the University of Waterloo suggests up to 70 per cent of shoppers in uptown Waterloo traveled there by bicycle, public transit or on foot. The study, completed by professors Markus Moos and Jeff Casello of the UW School of Planning, also found those who ride their bikes to shop in uptown spend about $30 during a single trip — the same amount as those who arrive by car and $10 more than those who walk or use public transit. 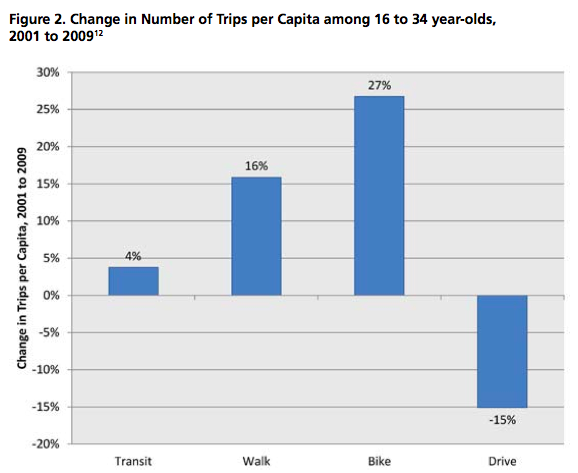 Cyclists also make more trips, on average, than other transportation users. Waterloo council understands its a myth that car shoppers are better than cyclists. Guelph (#11) is taking the bold steps needed to de-throne Burlington as Canada's best medium sized city to live in. This article in the Toronto Star caught my eye. Guelph - more than 100 km. of bike lanes in existence with another 110 km. in varying stages of approval!! By contrast, Burlington's 2009 Cycling Master Plan called for 40 km of bike lanes & 9 km of new paved shoulders in total by 2015. We're going into the 6 year mark. 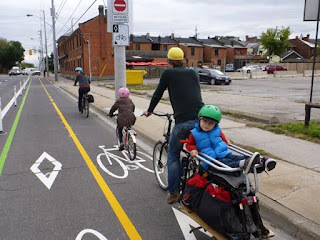 In that time Guelph added more than 100 km of bike lanes. Burlington will be hard pressed to add 40 km. Proposed additions to cycling infrastructure in Burlington - CMP. Studies continue to show that younger generations aren't driving and won't buy cars in the same amounts their parents did. Which forward looking city do you think the younger generation would choose to live and raise their families in? Great article on the decline of driving by young people. The roads we rebuild today (New St.) must take this into account! Our city planners and elected, or to be elected officials, should be planning for a future with less driving - NOW. Protected bike lanes on New St. from the downtown to Oakville is an investment made for the future. If we expect to attract talented young Canadians to Burlington, we've got to build to fill their needs. 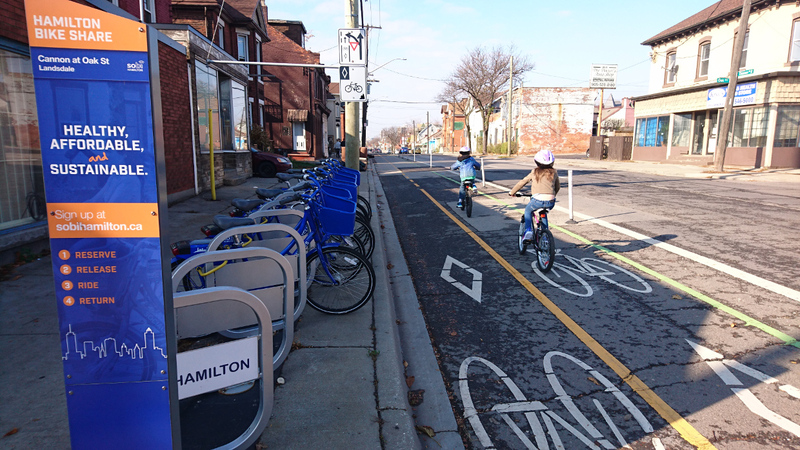 Hamilton has started this by building a protected bike lane along Cannon St. from Sherman Ave. to York St. towards Burlington. Hamilton Council has done it right!! With very little notice, hundreds attended the official opening of the Cannon Street cycle tracks. They are more than bike lanes!! And people are using them!